That's similar to what I had expected to see, but still begs the question: why am I not seeing it? That's what the FSM is indicating, but is it the same in real life? @cardoc reported Romraider indicating duty cycle % as high as 50%, so we know that at some point that ECU is working with a live duty cycle signal. Wish we had a log with the data in different driving situations and similar for several H6s. But all this is really just to confirm that there isn't something else involved that's been overlooked, and could apply to both your cars. Has to be something to explain the flat line . . . I have the same alternator. I have a "boomin system" which draws amps more than you're trying, (but not by a lot). I have no issues. My current system was in my old Legacy. I had problems on that car. I already used proper gauge power/grounds for the amps. I threw in a 200A alternator and any change was barely noticeable. Shortly after I did the big 3 upgrade and that solved all my problems. I did the big 3 upgrade on my current 05 when I transferred my system from old legacy. (The fancy alternator would not work in my H6). I was so happy when I had no dimming on this with just the stock alternator and some welders cable. It took me a long time to learn the importance of that simple mod. There is no need to remove anything factory. These 3 cables more or less piggy back the same route. If you still have issues or, it's better but not completely gone, then look at the ALT GROUND. My old Legacy needed a 4th cable because the pivot area wasn't conducting well. My 05 doesn't need the 4th cable. Try it before capacitors or fancy alternators. You'll need about 6' of 1/0 gauge, (max that fits ALT), welders cable and lugs. Be picky with the lugs. Look at the bolt holes where they are going first and get right hole size to maximize contact. The 50% cycle was with MaxiDas. I haven't had a chance to hook up RR to the car and check the readout, if any. Dito the grounding stevenva mentioned. I have dedicated batt and ground cables running from the battery to the amp in the storage tray at the back of the car and an extra ground strap from the amp to the body at the spare well. It all runs under the molding and carpet. And the amp test you did is okay, but the unloaded ampere output of the battery is important, especially with extra electrical loads from the car and stereo system. I use a Midtronics tester that reads high amp output. 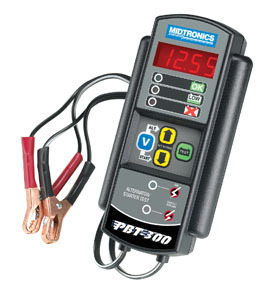 Also use it to check conductance loss between the battery and engine, transmission and body. My current system was in my old Legacy. I had problems on that car. I already used proper gauge power/grounds for the amps. I threw in a 500A alternator and any change was barely noticeable. Shortly after I did the big 3 upgrade and that solved all my problems. I did the big 3 upgrade on my current 05 when I transferred my system from old legacy. (The fancy alternator would not work in my H6). I was so happy when I had no dimming on this with just the stock setup and some welders cable. It took me a long time to learn the importance of that simple mod. Try it before capacitors or fancy alternators. You'll need about 6' of 2/0 gauge, (max that fits ALT), welders cable and lugs. Be picky with the lugs. Look at the bolt holes where they are going first and get right hole size to maximize contact. I don't know why alternator ground/block ground never occurred to me. Of course everything needs a full path for electrons. Still doesn't (at least to me) explain unloaded voltage at idle. Sounds low. The 50% cycle was with MaxiDas. I haven't had a chance to hook up RR to the car and check the readout, if any. . . Thanks for the clarification. I had presumed it was Romraider. Is the MaxiDas accessing the same ssm data for the ECM alternator duty cycle signal as Romraider? The scope seems to confirm what Romraider was reading, i.e., zero % duty cycle. According to the I/O tables, the duty cycle signal probably switches between a low level (~1 V) to high (~battery voltage). If the signal remains low, as the scope photos show, then I suspect (again, based on the Mitsubishi alternator function) the alternator internal regulator will tend toward the low end, i.e., the alternator output voltage will not reach as high as it should. The regulator will still function to control output, but at an overall lower average voltage because of the absence of any "high" periods in the duty cycle signal. Are both alternators original (to the car or to another) H6 units, or could they be "unknown" replacements? Not sure. I believe the one that was giving me problems was OEM. The one I took back was an O'Reilly special, "Optima" rebuild. before a half fixed Oreilys reman. (junk half fixed from running in a taurus and then a impala, and then a camry.....marked with a lifetime warranty...we actually have a huge # of threads on EZ30D cars with problems on half rebuilt alternators not "made" for the EZ30D . or the real OEM Mits from Maniac. Every H6 I've dealt with does the same thing. Unless the battery is low the alternator output remains low supplying only bare minimum amplitude. When you measure it in voltage output, the voltage value is low, maybe only 0.5V over what the battery voltage measures unloaded. You shouldn't expect 13V or more all the time from an alternator that is designed to function in a manner that reduces engine load. If it is consistently lacking charge value over a long period of time, then there is an issue, but then it goes back to source current from the battery. Is it providing support for the system? Is there enough available for the alternator to amplify the current flow? It all goes back to the battery. I put a new battery in my car in January that is rated at 650 CCA and it measured at about 600 when I installed it. In May, I checked it and it measured at 880. My alternator is at minimum output at idle and at times, lower than 13V cruising because the battery is supplying enough amperes to run the car effectively. On the flip - will also run higher voltage at idle some times, fluctuating the current. To me, the alternator is functioning normal. I bought an alternator from Advance some years back in a pinch. Their listing showed it to "fit" the H6. It acted stupid from get go. I would expect the same from other parts chains. Maybe something's changed and they've gotten a clue. Still don't trust them on Subies or European cars.
. . . To me, the alternator is functioning normal. . . Appreciate the observations about possible lower charge level at idle, etc. Well described. Could you confirm that the ECM signal at terminal #3 of the alternator connector indeed drops to zero % duty cycle, and is more-or-less flat at around 1 V, under those conditions? That would be helpful regarding test measurements in any future H6 alternator-related threads. Would it be excessive to think about getting the 180A one from DC Power Inc.
...or should I stick with the one I've got since according to cardoc and what we've figured out so far, it's working as intended?